The 10th Annual 2015 ILTA / InsideLegal Technology Purchasing Survey was released at ILTACON last week. It’s a quick read and I recommend taking a look at the entire report. As an introduction to the tech survey, I’ve highlighted the five points that I found most interesting and indicative of our times. 184 unique member firms responded to the 34 question survey. The percentage of firms spending $8K to $17K per attorney per year is up this year to 43% from 38% in 2014. #2 – What is the biggest issue or challenge facing your department? I see this as the most telling response in the survey. This year “security management” tops the list at 59%, up from fifth place in 2014 (30%). For seven years, “email management” was the top issue. 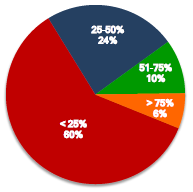 In 2015 email management is number two at 48%. 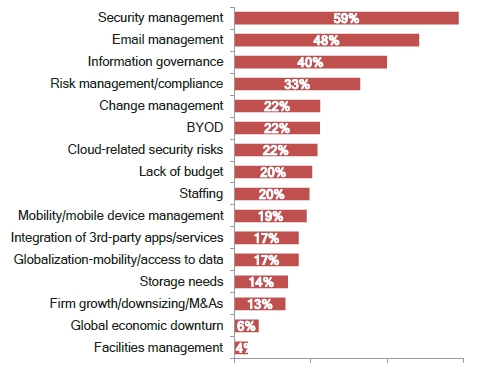 This year “Cloud-related security risks” (22%) is down to issue number five from issue number two in 2014 (44%). #3 – What technology purchases will you make in the next 12 months? The top five planned purchases for next year include laptops/notebooks (55%); desktop hardware (52%); security/network security/security assessment (32%); network upgrade/servers (31%); and printer/multi-functional devices (30%). What’s new in purchases in 2015? Microsoft Office 365 was new to the master list of candidate purchases this year, with 13% of firms reporting having purchased Office 365. This is a significant figure and I suspect that it is up from very slight usage as recently as 2013. #4 – What percentage of your firm’s software and services offerings could be Cloud-based in the next 1-3 years? This is the first year for this question in the survey. No mass exodus to the Cloud is indicated. 60% of the survey respondents indicated that less than 25% of firm software and services could be Cloud-based in the next 1-3 years. Equally interesting to me is the response of 6% of firms that over 75% of their software and services could be Cloud-hosted. Adoption of Cloud-hosted services is very dependent on the size and focus of the firm and on the requirements of the firm’s clients. 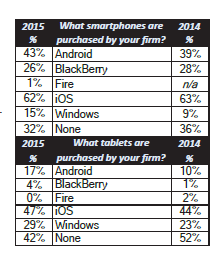 #5 – What smartphones & tablets (by operating system) are purchased by your firm? As the report cites, in 2012, 49% of respondents purchased BlackBerry smartphones. 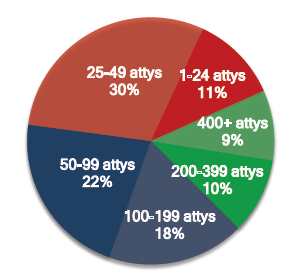 In 2015 the figure is roughly half of that at 26%. What I will be watching going forward is the Android figure. With the “Stagefright” vulnerability earlier this year, there has been increasing concern regarding the challenge of upgrading the Android OS when security patches are issued. Each quarter, Apple reports increasing conversions to iPhone from former Android users. I attended the “Mobile Device Management Shootout” session at ILTACON this year. I was amused by one CIO’s description of their smartphone phone BYOD policy. He said when they started BYOD several years ago they allowed any mobile device. Following that, they allowed iOS devices plus specific models of Android devices. Now, employees can use any device which they like, as long as it has an “Apple” on it. He cited concern regarding the difficulty and further, inability, to upgrade the Android OS as one reason to support iOS devices only. There are numerous other interesting points on Cloud-hosted services, technology purchases, and even social media in the tech report. Which points do you find interesting? If you like, send me tweet with your top points at @mobilehelix. This entry was posted in HelixPulse Blog, Legal Technology, Mobile Industry News, The Future of Legal IT and tagged Android, ILTA, ILTACON, iOS, Mobile devices, security, Tech Survey by Maureen. Bookmark the permalink.